In the first installment of our history series, I discussed the complex politics of hemp in the decades before the American Revolution. Hemp was an important part of early colonial economies in North America, where the fiber was woven into textiles and rope. It was, however, largely an imported crop rather than a domestic one. The hemp that was grown domestically was of an inferior quality, and military and merchant vessels looked for high quality Russian hemp, which was imported via England (where it would be taxed and re-exported). The colonies were economically dependent on the “mother country,” and it was this same economic situation, on a broader level, that led to the Boston Tea Party and ultimately to the American Revolution. 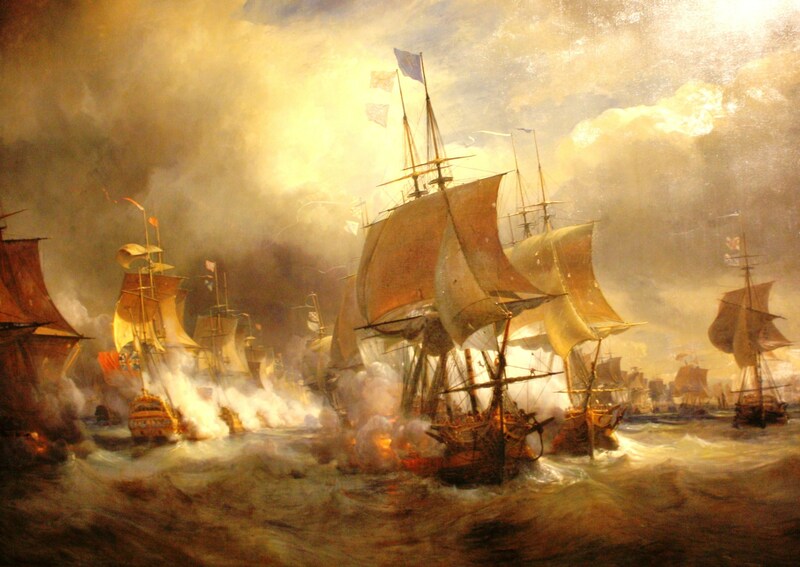 A painting depicting the 1778 Battle of Ushant during the Revolutionary War. Théodore Gudin (1802-1880). From Wikimedia Commons. As hostilities between the American colonists and England heated up in 1775 and trade with England was cut off, the demand for domestically grown hemp became an issue of survival rather than just economics. Every ship in the 11 state-sponsored fleets required thousands of pounds of rope and tough sails made of hemp (or, in some cases, flax), and much of soldiers’ uniforms were made from the fiber[i]. Farmers took up the patriotic challenge, growing hemp in large quantities throughout the war (the dramatic increase in prices helped). In Virginia alone there were at least 18 rope “walks” (factories) and four hemp processing mills during wartime[ii]. Immediately after the war, manufacturers continued to make rope and heavy cloth from hemp (although in smaller quantities), but the demand for domestically grown hemp reduced dramatically, as imported hemp was once again available[iii]. This imported hemp was, in large part, still coming through the old colonial channels which benefited British merchants and tax holdings at the expense of U.S. buyers. The first government of an independent United States “understood from their colonial history that it would be necessary to seek trade with Russia” directly in order to obtain sufficient hemp without relying on their former colonizers[iv]. Thus, in 1780, the U.S. named Francis Dana, lawyer and politician, to be the first American Minister to the Russian Empire. Dana spent three years in Russia, trying to get a hearing with Catherine the Great to convince her that trade was of mutual interest to the two nations. He explained in one letter that hemp was “the foundation of the principal commerce of Russia,” so it should be “of the highest importance to Russia to turn the thoughts of the Americans from the cultivation of this plant, or in other words, to make it their interest not to cultivate it”[v]. Dana was threatening that if Russia wouldn’t make direct trade easier, U.S. farmers might become direct competitors in the hemp market (a threat that never came to fruition, as I explain below). Catherine, however, snubbed Dana, probably as a political courtesy to England, and he returned to the U.S. in defeat after three years abroad. While these early negotiations failed, and much of hemp imports still came through England, by the end of the 18th century this was beginning to change through the sheer force of markets. Increasingly, ships from the U.S. were risking rough waters and less familiar business partners to trade directly with Russian merchants (sometimes going through Scandinavia rather than Britain, and sometimes going directly to a Russian port). Russians bought sugar, indigo, rice, wine and rum from U.S. ships, much of which was obtained in the Caribbean[vi]. Ships brought hemp, and hempen materials like duck (a very thick, canvas-like material) back to the United States, among other goods. Diagram of rigging on a sailing vessel. From Wikimedia Commons. The European, Napoleonic wars in the early 19th century greatly affected transatlantic trade, but they did not fundamentally alter these basic trading trends between the U.S. and Russia. The War of 1812 did briefly cut off trade between Russia and the United States, once again stimulating demand for domestic hemp, but even this disruption didn’t keep U.S. ship manufacturers from going right back to imported Russian hemp after trade resumed. Despite many efforts on the part of government, farmer, and patriot, the preference for Russian hemp was never quite ousted from the culture of the U.S. manufacturing industry. U.S. farmers were growing the same plant as Russian farmers, in ideal soil conditions, and they were just a mountain range, rather than an ocean, away from domestic rope and canvas manufacturers. So why was it so difficult for farmers in the U.S. to compete with Russian hemp in supplying the rope manufacturers? The short answer is ironic but simple: U.S. rope and canvas manufacturers didn’t want domestic hemp because of the way it was treated after harvest, and domestic farmers didn’t have an economic incentive to change their methods. One of the central issues in the whole scheme is that of “retting.” Retting, derived from the word “rotting,” is the process of wettening the hemp, post-harvest, to loosen the fibrous outer layer of the plant from the woody core, making it easier to separate out for production (for a more thorough explanation on the different parts of the hemp plant, see our blog post about it). The two ways of retting were “dew” retting and “water” retting. Dew retting is a very simple process: merely leave the plant out in the field after harvest and let the nighttime dew, the daytime sun, and the eventual bacterial growth ferment the hemp until the fiber is loose. Water retting takes a bit more work: the hemp is taken to a pond, or constructed tanks, where it is held underwater for a week or more, until the fiber has come loose. Laying out harvested hemp for retting in a field in Kentucky. The earliest colonial farmers in North America adopted the dew retting method, and it stuck. While less labor intensive, and often seen as better for the soil, dew retting produces a final hemp product that is darker in color, less uniform in quality, and weaker. In other words, dew retted hemp was not ideal for the construction of a naval vessel’s most important components, it’s ropes. An experiment in the 1820s comparing Russian, water retted hemp, and U.S., dew retted hemp, found that “after being thus worn for nearly a year, it was found, on examination, that the Russian rope, in every instance, after being much worn, looked better, and wore more equally and evenly than the American; that the yarns of the former were rather stronger, and the number of broken yarns not so great as in the American”[vii]. The navy was skeptical about all U.S. grown hemp, but fears of relying on a foreign country for such a vital component of U.S. military force did convince them to try to find water retted hemp within the country. 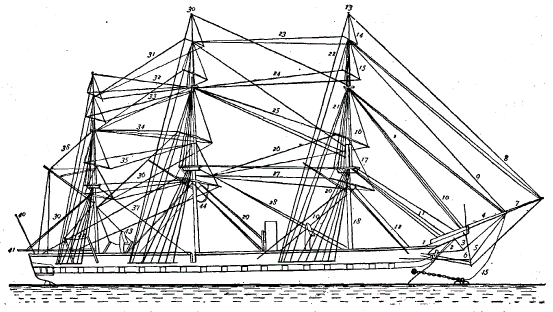 An 1827 U.S. Navy Document reported that “the American hemp loses nothing in comparison” to Russian hemp when it is “water retted.” However, the navy was skeptical about getting enough of this hemp because “the habit of dew-rotting has become so fixed, that it is apprehended a considerable time will elapse before the American community can be persuaded to change it.”[viii] The Navy saw dew retting as merely a force of habit amongst farmers, and many in the industry shared this belief. But a closer look at the hemp markets of the time reveal that it was not just stubbornness that kept farmers from switching over to water retting. There were economic reasons, as well. Much of the hemp that was grown in the late 18th and early 19th centuries was not used in industrial manufacturing at all, but was made into cloth by hand in frontier homes. According to the 1810 census, “nearly 65,000,000 yards of cloth, made principally of cotton, flax, and hemp, or a mixture of these fibers, were manufactured in American households. This would provide about double the quantity of cotton and linen cloth per inhabitant that we imported in 1830.”[ix] These rural hemp growers didn’t need their fiber to withstand years of salt water and pressure aboard a navy ship, nor did they need to meet other industry standards because they were just making their own cloth. Dew retting would work just fine for this. 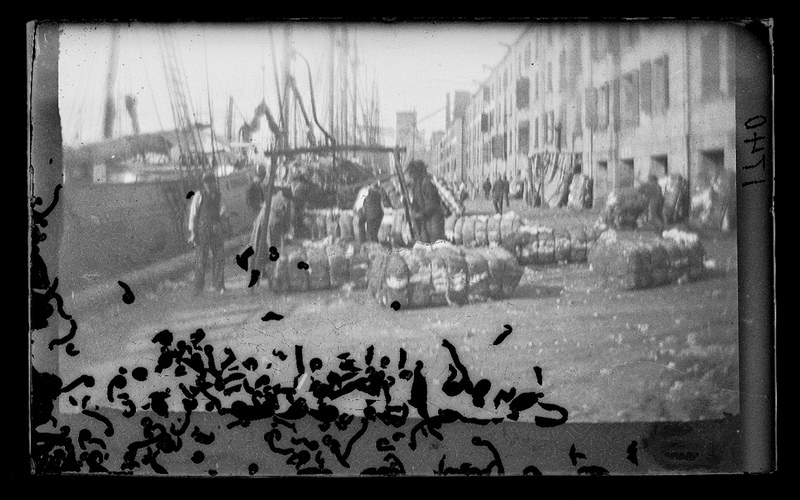 Damaged photo of cotton bales getting ready to be shipped across the ocean. From Wikimedia Commons. Thus, besides the fact that water retting was seen as ecologically destructive, fouling up ponds and killing fish, U.S. farmers had little economic incentive to switch their methods. It was hard to convince someone to use a more labor intensive harvesting method and to pay to ship their product all the way across the Appalachian range to the east coast ports for it to be inspected by the navy and maybe sent back, when they could get a relatively good price by just sending their hemp down the river. The farmers were selling to the most accessible market (not unlike farmers selling their corn, soy, and maybe soon enough hemp, to the biofuel industry today). Each individual farmer took the path of least resistance, looking at short term interests, like a farmer usually has to in order to survive. But the net effect of everyone acting in their personal, short-term interest was a hemp industry that never diversified: the infrastructure to ship hemp from Kentucky to the east coast never developed, domestic manufacturing plants that could make hemp into fiber weren’t created on a large scale, farmers never mechanized (in large part, because they held on to the institution of slavery, more on that below). Everyone, from the manufacturers buying Russian hemp to the farmers selling their crop down the river, was looking out for themselves, rather than thinking as an industry that wanted to last for years to come. Thus, the domestic hemp industry wasn’t self-reliant, able to adapt to changing times. Instead, it was deeply entwined with the fate of cotton and the industry never built the infrastructure for multiple supply chains. As James Hopkins put it in his seminal history of the Kentucky hemp industry, “the price of the fiber was undependable, but…it was usually high enough to encourage production, which reached its greatest height around 1850.”[xi] The volatility in hemp prices was largely due to changing demand from the cotton industry, and it was sometimes severe. For example, in Missouri in January of 1846 hemp sold for $65-$68 a ton. Six months later the prices were $40-$46 a ton. Just over a year later, in November of 1847, hemp was selling for $110 a ton. [xii] Throughout the first half of the 19th century there were efforts to help regulate and spur the hemp industry through legislation. As early as 1802 Kentucky citizens requested that congress add additional duties to imports of hemp and hempen goods, to help protect domestic hemp farming and industry. [xiii] The congress did not pass the law. In 1841 congress did pass an act that required the navy to purchase U.S. hemp, whenever possible[xiv]. However, the navy still could not find enough domestically grown hemp of sufficient quality. In short, despite efforts at regulation, the hemp industry responded to the economic incentives of the market, not the political incentives of those who wanted to protect domestic industry. Despite the volatility of the crop’s prices from the beginning, hemp farmers kept on growing the crop, and it saw it’s peak years in the middle of the 19th century, right before the Civil War. Between 1850 and 1860, national hemp production more than doubled, going from 34,871 tons to 74,493 tons[xv]. In this decade the cotton industry was booming, slave labor was legal, and demand for hemp was relatively consistent. By 1865, all of this had changed. The Civil War marked the beginning of the end for the hemp industry in the United States. The Confederacy put an embargo on cotton exports to most of Europe and cotton acreage was voluntarily curtailed to grow other goods for the war effort, meaning that there was, overall, much less cotton to bale in the south. The demand for hemp from the American agricultural heartland plummeted. But the biggest hit to the hemp economy was the loss of slave labor. As Hopkins writes, “the production of hemp, and the processing of its fiber, was always a labor-intensive operation. 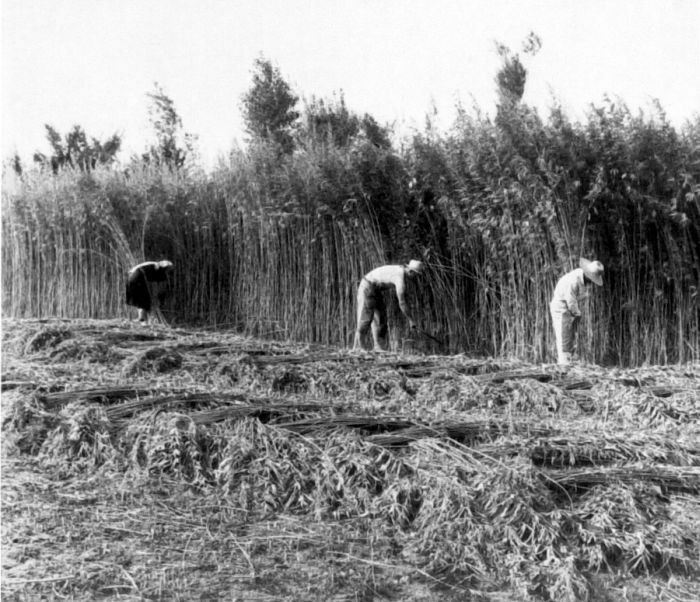 Every phase of its production, planting, cutting, breaking, and fabrication, required the use of intensive physical labor.” There were no significant technological advances in hemp farming in the 19th century and “hemp growing in 1935 was no less laborious than it had been in 1835.”[xvi] The difficulty of finding cheap labor for the hemp harvest was always a limiting factor in the industry, and the answer was, for almost all hemp farmers, slave labor. In states like Kentucky and Missouri, where the majority of the country’s hemp was grown, the gruelling labor of sowing, harvesting, and breaking the crop was done almost entirely by slave labor. In fact, the crop was so exclusive to slave labor that white workers had developed a serious prejudice against it, and would not work in the hemp fields. 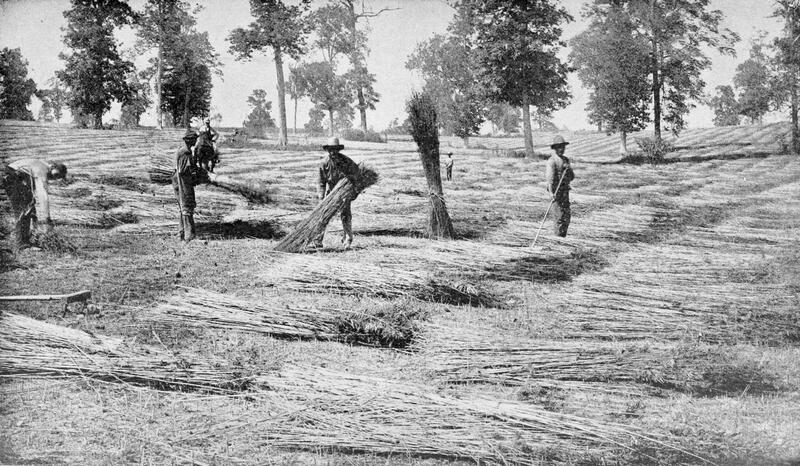 One Lexington farmer stated, in 1836, that it was almost impossible to hire workers to break hemp because it was such a dirty job that “scarcely any white man will work at it.”[xvii] Quite simply, the hemp economy was a slave economy. This was the state of the industry into the early 20th century, when we begin to see efforts to criminalize the cannabis plant: hemp was a marginal crop in the United States. This happened, in large part, because it had been dependant on slave labor, which was outlawed, and on the unstable cotton economy, which innovated to no longer need hemp. Today’s hemp economy is far more diverse than it was back in 1850. We make food, clothing, building materials, medicine and car parts from hemp, not just rope and baling. However, there are still ways in which we throw our eggs into one basket: CBD oil and hemp seeds are examples. While these are fantastic products for us to invest in, they are just a sliver of hemp’s potential as a renewable, sustainable plant. If the hemp industry becomes too closely associated, culturally or economically, with any single product, or with the marijuana industry, we risk a crash if there is a sudden shift in public opinion or market. Personally, I have a slight hesitation when I go to the industry conferences and see that every other booth is a CBD startup. If hemp becomes too closely associated with CBD oil, and then the oil becomes heavily regulated (which is likely, from one agency or another), we risk a big bust after the boom. It’s not that CBD oil is not a worth investment and a powerful, important medicine, it’s just that we need to be wary of everyone jumping into the same, small bandwagon when there are so many other opportunities out there. If we fail to build multiple supply chain infrastructures (farming, processing plants, manufacturing plants, and domestic markets), if we just take the path of least resistance, we will be vulnerable, like those early farmers that relied so heavily on the cotton industry. But, if we do develop a diversified and advanced hemp economy, we can outlast changes in the world economy and consumer attitudes as a dynamic industry that thinks about the true long-term. Another lesson that we can learn from this history is that the hemp industry was not always progressive. Many hemp farmers were slave owners who supported the confederacy in the south. The manufacturers of hempen maritime goods cared little about helping poor farmers, much like the major biofuel companies of today don’t necessarily care about the sustainable family farm. Large corporations may help boost the industry, but we shouldn’t forget that they are out to pay as little as possible for hemp, no matter where it comes from. The politicians who lobbied for laws to protect the hemp industry were, in large part, just trying to please their constituents, not create a sustainable economy. Indeed, the politicians that support hemp the most today are not necessarily environmental crusaders. This is not to say that the history of hemp is all about greedy people trying to make a buck, but it is to say that we should be wary about whitewashing the history rather than learning our lessons from it. Hemp is not automatically a “green” or socially-conscious crop, just because it has been demonized by those in power. We have to earn our place as a sustainable, progressive industry. And I think we will. [iii] Crosby, A. W. (1965). America, Russia, hemp, and Napoleon: American trade with Russia and the Baltic, 1783-1812. Page 18. Columbus: Ohio State University Press. [iv] Borougerdi, Bradley J. “Cord of Empire, Exotic Intoxicant: Hemp and Culture in the Atlantic World, 1600-1900.” page 100. Order No. 3626432 The University of Texas at Arlington, 2014. Ann Arbor: ProQuest. Web. 20 Aug. 2016. [vi] Crosby, A. W. (1965). America, Russia, hemp, and Napoleon: American trade with Russia and the Baltic, 1783-1812. Page 43. Columbus: Ohio State University Press. [vii] Rodgers, J. (1827). American water-rotted hemp (pp. 3-5) (United States, US Navy). Navy Commissioners’ Office. [ix] Clark, Victor S. History of Manufactures In the United States: 1607-1860. Page 253. Washington, D.C.: Carnegie Institution of Washington, 1916. [x] Hopkins, James F., and Clark Thomas D. A History of the Hemp Industry in Kentucky. Page 57. U of Kentucky, 1951. Web. [xii] Holmes, William C. Nineteenth Century Hemp Culture in the Missouri River Valley. Page 198. 1982. Print. [xiii] Hopkins, James F., and Clark Thomas D. A History of the Hemp Industry in Kentucky. Page 80. U of Kentucky, 1951. Web. [xv] Clark, Victor S. History of Manufactures In the United States: 1607-1860. Page 326. Washington, D.C.: Carnegie Institution of Washington, 1916. [xvi] Hopkins, James F., and Clark Thomas D. A History of the Hemp Industry in Kentucky. Page X. U of Kentucky, 1951. Web. [xviii] Holmes, William C. Nineteenth Century Hemp Culture in the Missouri River Valley. Page 63. 1982. Print.